Eforea Nail And Body Spa: Your Next Spa Party Destination! When In Manila, the stress that comes after a long, busy week is so common, it almost sounds like a cliché. Hence it’s not surprising that despite the over-congestion of the metro, among one of the most popular businesses you see sprouting about like mushrooms are hubs for R&R (rest and relaxation), because everyone could use a break! Yet how do you differentiate one from all the others? Location is key, as well as service. Amidst all the popular spas and massage centers today, Eforea Nail and Body Spa along P. Tuazon in Cubao was a pleasant surprise — I wasn’t expecting to find this smack in the middle of Cubao. Eforea was surprisingly easy to find: Just Waze P. Bernardo Elementary School and they’re across from that. 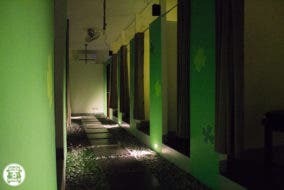 We were met with bright, posh interiors at Eforea, a refreshing sight from the usual moody setting other spas invoke. This was clean and light, almost welcoming you in this safe space, with the lighting automatically soothing to the eye. I personally loved the white-and-blue theme going on– simple, understated but elegant and chic. The first thing I thought of upon entering the lobby? Two words: Spa party! Spacious, posh and modern, this would be a great place to bring your friends too– and if your male companions are iffy about day spas being too “girly”, perhaps the blue hue won’t intimidate them too much. We also enjoyed the sight of plush leather chairs with built-in foot spa tubs. I loved how everything was so efficient, that it made it easy for the attendants to just pull out and stow away when needed. It felt neat, organized and sophisticated, which translated in the services they provided! Eforea Nail and Body Spa asserts that their spa services are centered on wellness and healing: their attendants are trained in the art of healing, from the traditional hilot to the more popular and contemporary Swedish and shiatsu massages. Having this at the very core of their offerings and amenities, though you can still prettify your hands and feet like in most salons and get a gorgeous mani-pedi, why not get a therapeutic foot massage beforehand? What I liked about Eforea’s foot spa services was that the attendants massage your feet and legs after every step, which they revealed was done on purpose as part of the therapy, something that elevates their process from other spas that offer foot spa services. This is why their foot spas take a little longer than usual, but it’s definitely worth the time! I’ve always been a believer of clearing out your schedule for half the day when you’re getting pampered, so you don’t rush in getting that relaxing break. While normally, you would receive the standard foot scrub and soak, they make sure that your feet get the therapy that they need. Eforea offers different masks, depending on your preference and skin needs. I chose the lavender mask, as I wanted something soothing. It’s also said to have anti-fungal and anti-bacterial properties. The attendant painted on my mask, which I thought was a nice touch. After letting the mask sit for a few minutes, they rinsed it off, applied lotion and this pink powder which they called a “foot blush”. Why not! Know how our massage experience went on the next page!